Plenty of companies claim to work towards empowering women and putting females first, but how many can tangibly prove that they're doing just that? It's one thing to work with a mission of serving and bettering the lives of women through transitional and transformative life moments, but it's another to do so while simultaneously hiring, promoting and retaining an employee base of women as the majority. And that's exactly what XO Group excels at doing. The company, which oversees multi-platform brands The Knot, The Nest and The Bump, serves over 20 million women each month through their most definitive and challenging life changes. We sat down with Dhanusha Sivajee, XO Group's EVP of Editorial and Marketing to talk about the company's 20+ year history of being 'for women, by women' at a time where it's more crucial then ever to put women at the forefront. AOL: What exactly does XO group do? 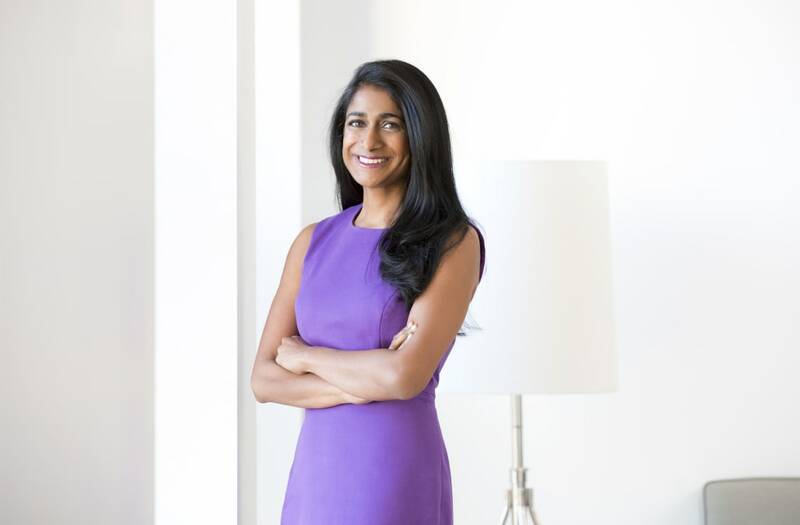 Dhanusha Sivajee: "XO group owns a family of brands – The Knot, The Nest and The Bump. We help women through transformative life stages, whether it's getting married, moving in together, or having a baby and raising a family together. I oversee marketing, editorial and PR, so I get to essentially think about our brand and what we do for our users each and every day." AOL: How do your responsibilities vary on a day-to-day basis? DS: "My role is pretty varied...My day could range from coming in, checking emails and thinking about the day in terms of what PR hits and marketing campaigns we're running, to brainstorming and conducting sessions with product and tech where we're thinking about our users and what our product roadmaps could look like." AOL: Explain more about this notion of being run "By women, for women" – How exactly do you see it playing out in XO Group? DS: "Run by women is interesting – 70 percent of our company employee base is female. As women move up through the ranks they typically vanish, but we're really proud of the fact that at XO Group, not only do we have that 70 percent number, but nearly 60 percent of our executive team is female and almost 40 percent of our executive board is female. The numbers speak for themselves. The stats show that women in general are better leaders, and companies that have strong female leaders tend to outperform their counterparts. But when we're hiring for a role, we actually just look at the best candidate, the best fit. It just so happens that 7 out of 10 times it's been a woman. Each and every day, we're serving over 20 million women and we empower them to be their true selves and to make decisions for themselves...we're really trying to empower them not to be held down by judgments, and to do things their way. [XO Group's mission] resonates with both men and women and [the company attracts] a broad and diverse candidate pool." AOL: Who has been the strongest, female role model in your life? DS: "My mom... She's always had this philosophy of being hungry and humble, and that's something that to this day stays true with me. [My parents] ran a lot of small businesses, and while they may not have had 'MBA-speak' or 'college-speak', it was always about trying to figure out 'what does the customer want?' and then work with real fury and urgency to give them what they want." AOL: What do you think the importance role models are for young female professionals? DS: "For women in particular, it's important for us to be able to give back to the next generation. That's something that's really important to me as a person and to the mission of XO Group as well." AOL: If you could give two pieces of advice to aspiring entrepreneurs and females in media, what would they be? DS: "H and H: Be hungry and be humble" [and] "act and think like a startup—if you put your user first and really think about their needs, you're going to win every time." AOL: How do your fellow female colleagues inspire you daily? DS: "They inspire me every day just by the sheer willpower and multitasking that they bring to the world. Not only are they good at what they do, and are badass women, but they are balancing so many things in their lives." AOL: What do you feel is key to achieving balance in your professional and personal life? DS: "Not overthinking things and not taking yourself too seriously...being proud of what you bring to the table, but not taking yourself so seriously that you think it's all going to fall apart if you're not there." AOL: What was the best piece of advice you've ever received? DS: " This idea of your career being like a hockey stick—there's a moment in time when you're here and you're like 'when am I going to make it big, when am I going to be like that person, like my mentors? And then there's that hockey stick moment — Wait for yours. Be patient, but keep pursuing it." Learn more about XO Group and their affiliated brands here.